The Windsor-Detroit Bridge Authority (WDBA) today announced it has selected Bridging North America as the preferred proponent to design, build, finance, operate, and maintain the planned Gordie Howe International Bridge that will span Detroit and Windsor. Construction is projected to start later this year and take four to five years to complete. 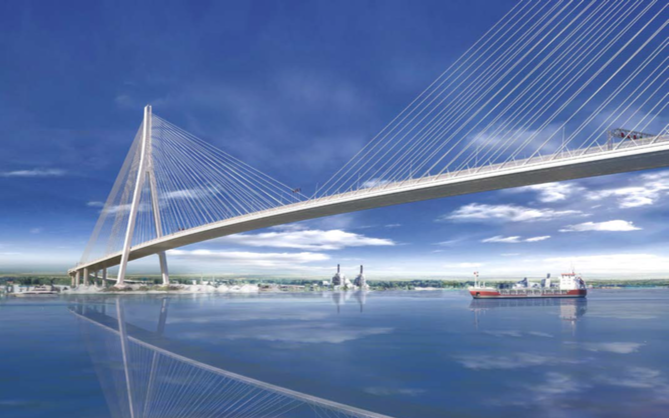 Bridging North America, which includes Fluor Corp. in Irving, Texas and ACS Infrastructure Canada, among others, has selected a cable-stayed design for the bridge. The six-lane, 1.5 mile span will have an “A” shape, and when completed, will be the longest main span of any cable-stayed bridge in North America at nearly 2,800 feet. The project includes the construction of a U.S. Port of Entry, Canadian Port of Entry, the bridge, and a new I-75 interchange. Bridging North America, which competed against two other finalists for the project, is expected to hire dozens of local and regional subcontractors on both sides of the border. Over the coming months, WDBA will negotiate final contract details with Bridging North America. The cost of the project, design details, and expected construction schedule will be announced following the financial closing, which is expected by the end of September. WDBA says the new bridge will provide for redundancy with the Ambassador Bridge and the Detroit-Windsor Tunnel at what is the busiest trade corridor between the U.S. and Canada. Highlights include improved border processing and highway-to-highway international connectivity. The Gordie Howe International Bridge project is a planned bridge and border crossing spanning the Detroit River and connecting Detroit and Windsor by linking I-75 and I-96 with the new extension of Highway 401 (Rt. Hon. Herb Gray Parkway) in Ontario. Fluor and ACS Infrastructure Canada led the development phase of the project and will hold the prime contract. This is the second project in the Windsor-Detroit area where Fluor and ACS have partnered. Fluor and ACS recently delivered, and are currently operating and maintaining, the Rt. Hon. Herb Gray Parkway in Windsor that will connect to the Gordie Howe International Bridge. Fluor and ACS will operate and maintain the facility for 30 years to performance standards that will be established by WDBA following completion. Founded in 1912, Fluor is a global engineering, procurement, fabrication, construction, and maintenance company in Irving, Texas that ranks 153 on the Fortune 500 list with revenue of $19.5 billion in 2017. The company has more than 56,000 employees. ACS Group is ranked first among the list of World Top Transportation Developers by Public Works Financing Magazine and No. 1 in the ranking of Top International Contractors by Engineering News Record. The Windsor-Detroit Bridge Authority is a not-for-profit Canadian Crown corporation created to manage the procurement process for the design, build, finance, operation, and maintenance of the Gordie Howe International Bridge through a public-private partnership (P3). WDBA is also responsible for project oversight. • ACS Infrastructure Canada Inc.
• RBC Dominion Securities Inc.
93 percent of properties required for US project components have been acquired/under control and required resident and business relocations have been completed. 255 buildings have been demolished on properties under MDOT’s control. Over 30,000 ft (almost 6 miles) of electric cables have been installed. Over 6,640 cubic yards of debris has been removed from vacant parcels of land. Over 4,600 trees have been removed from lands already acquired for the project. Construction of eight new sewer crossings on a portion of I-75 has been completed. Over 1,600 ft (over half a mile) of pipes and box culverts have been installed. Over 7,700 ft (over 1.5 miles) of gas lines have been installed to meet current and future needs. Over 1 million tons of fill – equivalent to 34 shiploads – have been placed to grade and sculpt the site. More than 27 km (almost 16 miles) of cabling has been relocated. Over 902 tons of waste material has been collected. 3 transmission towers have been constructed as part of the hydro transmission and distribution activities. Construction of 2 new stormwater management ponds and rehabilitation of the Broadway Drain is complete. Over 6 km (over 3.5 miles) of gas lines have been installed to meet current and future needs. To date, more than 4.6 km (almost 3 miles) of exclusion fence has been erected to limit access to the site by species at risk, other wildlife and people.